Why would a candidate split sentences in order to create an untruthful claim about his opponent? For many years Karl Peterjohn has been calling for a raise in the county sales tax, yes. That’s the first part of the plan. The second part of the plan is to eliminate the county property tax. Why would a candidate split sentences in order to create an untruthful claim about his opponent? You’ll have to ask David Dennis. thanks for pointing this out, Bob. 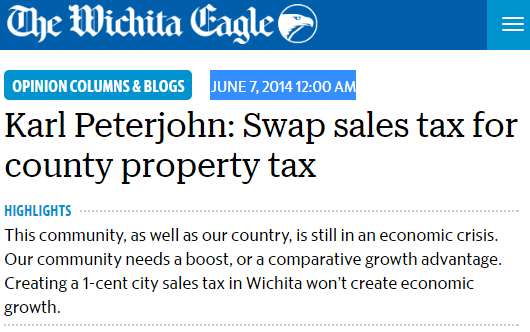 I am a neophyte to Wichita politics, and am starting to form my opinions of who’s who. 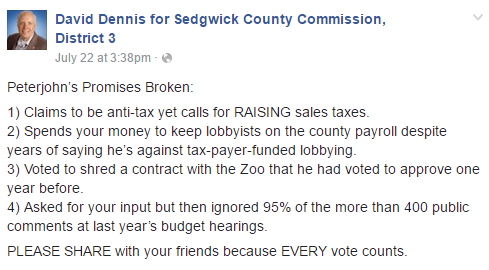 Dennis’ MO appears to be transparent duplicity!